Why does a cat like high places? A cat likes climbing to high places indoors because heat rises! Usually the highest spot in the house is the warmest & that is exactly where your cat wants to be. Climbing to heights can be a signal of dominance in a multiple cat household. The cat who sits atop the highest spot is usually the one who is in control, the boss. The higher the better if you are a cat. Remember, our lovable furry friends used to live in the wild & many of their traits come from nature. 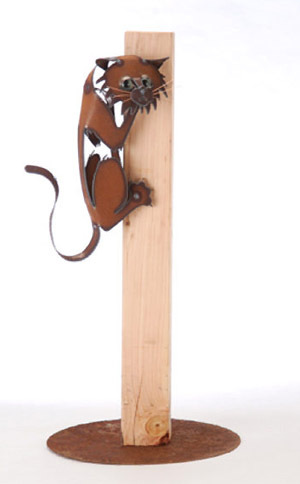 Henry Dupere Climbing Cat Garden Sculpture. 15" tall by 10" wide. Three-dimensional rusted metal climbing cat garden sculpture.